Following Governor Brown’s State of the State address, victims of urban oil drilling joined health professionals and members from the Oil Money Out Campaign (see the full list below) at a press conference on the north steps of the state capitol, delivering 80,000 petitions to Governor Brown calling for oil money out of California politics. Gabriela Garcia, whose family lives near LA’s oil wells, shared her personal experience and health problems that resulted within her family and community due to living in close proximity of urban oil drilling. She was joined by Melissa Johnson-Camacho, RN, as well as other experts and advocates, who sent a clear message to Governor Brown demanding he listen to state scientists who have determined in the California Council on Science and Technology (CCST) report that fracking and urban oil drilling are dangerous for Californians. In 2015, the California Council on Science and Technology (CCST) report, mandated by SB 4, the state’s law on fracking, determined that fracking and urban drilling are dangerous for California. It urged mandatory human health buffer zones around all oil operations to protect public health. To date, none of the scientific recommendations have been implemented, leaving communities and individuals vulnerable to impacts. According to an analysis of data from the South Coast Air Quality Management District, oil companies used more than 98 million pounds — or 49,000 tons — of chemicals known to cause serious health effects in humans (“air toxics”) in Los Angeles County between June 2013 and February 2017. Notably, of the most commonly used air toxics, over 10 million pounds of Hydrofluoric Acid and 120,000 pounds of ethylbenzene were used in drilling operations. Physicians Scientists and Engineers did a study which similarly analyzed the data collected by the South Coast Air Quality Management district called a “Comparison of chemical-use between hydraulic fracturing, acidizing, and routine oil and gas development”. The data shows that there is significant overlap in chemical-use between so-called unconventional activities such as fracking and acidizing and more routine activities conducted for well maintenance, well-completion, or rework. These scientists found that a comparison within the data of the chemicals from fracking versus the chemicals used in conventional operations shows a significant overlap between both types and amounts of chemicals used for well-stimulation treatments included under state's mandatory-disclosure regulations and those used in routine treatments that are not included under state regulations. This means that the use of these toxic chemicals is NOT being regulated by the state. California has a reputation of leading the fight for environmentally friendly policies, yet the reality is that it has an oil problem. In the 2016 legislative session, the oil industry spent an historic $36.1 million to lobby California lawmakers. Environmental and public health advocates’ efforts to protect the environment have been thwarted because of the financial power of the fossil fuel industry, and Californians are fed up with pay-to-play politics. It’s time they put the people’s best interest first. All the mainstream Democratic candidates for governor have signed a pledge to swear off oil money. If Jerry Brown wants to live up to his rhetoric, he needs to demonstrate that real climate leaders prioritize public health over oil industry profits. They don't enable the worst climate polluters and allow drilling to expand. In his last year in office, the Governor has the power to enact scientifically recommended protections with the swipe of a pen, and right the wrongs that are currently happening in numerous communities around the state, not to mention begin to fix our democracy here in Sacramento. 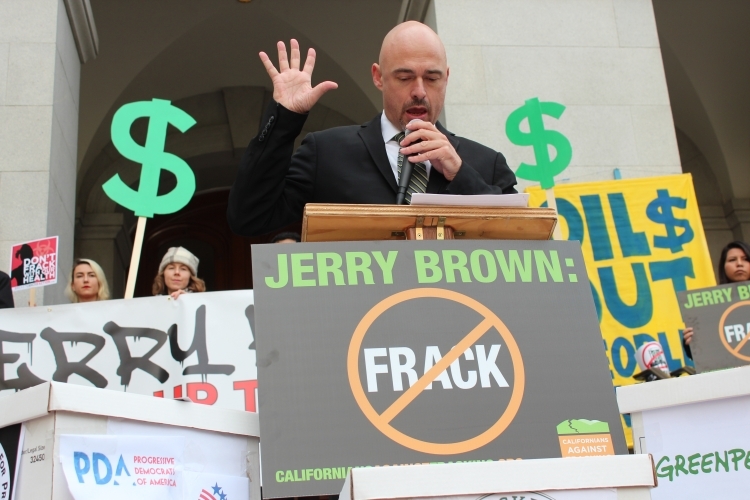 We are calling on Governor Jerry Brown to take bold action to actualize his legacy as a climate leader by standing up to big oil and putting an end to fracking and dangerous drilling in California. Governor Brown needs to know that his last year in office will make or break his legacy. The Governor needs to know that we aren’t going to accept half measures for the very real problems our state is facing around oil and gas extraction, transportation, refining, and storage. If the governor wants his Global Climate Action Summit next september in San Francisco to be supported by the environmental, health, environmental justice and frontline communities around the state, he is going to have to protect our communities and address the state’s giant oil problem. 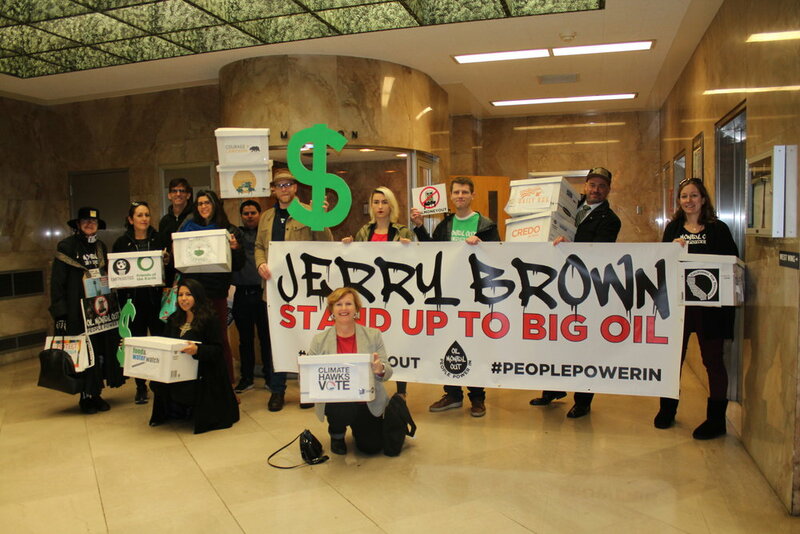 There is nothing more we’d like to do than celebrate Jerry Brown’s climate accomplishments. We need our leaders to acknowledge that oil money is a problem. And that in our democracy in the great state of California, we need to get Oil Money Out and People Power In. The 80,000 petitions calling for California politicians to stop taking oil money were collected by CREDO, Center for Biological Diversity, Rootskeeper, Other 98, Friends of the Earth, Daily Kos, Progressive Democrats of America, People Demanding Action, Amazon Watch, Breast Cancer Action, Stand.Earth, Climate Hawks Vote, Earthjustice, Courage Campaign, Food & Water Watch, Greenpeace, RootStrikers, California for Progress, Earthworks, 350 Silicon Valley, Sunflower Alliance, and others. Watch & Share Our Recap & Livestream Videos Below!